We've told you about the best tacos in the entire city, but LA is a really, really big place, and sometimes you're not always in "best taco" range. For all of those times, you'll want to consult this: a list of the best taco shops in TWENTY-THREE different LA neighborhoods, so you can always find an awesome handheld in LA. 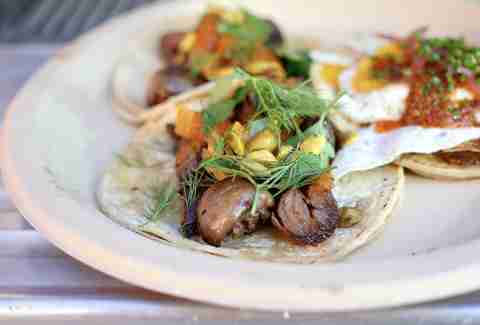 These guys have singlehandedly kept the gourmet food truck scene in LA relevant with their insane taco creations. On Wednesday and Thursday they park in front of Blacktop Coffee (826 E 3rd St), and on Saturday and Sunday they're in front of Blue Bottle (582 Mateo St). Which means on Wednesday and Thursday you should be in front of Blacktop Coffee (826 E 3rd St) and on Saturday and Sunday you should be in front of Blue Bottle (582 Mateo St). 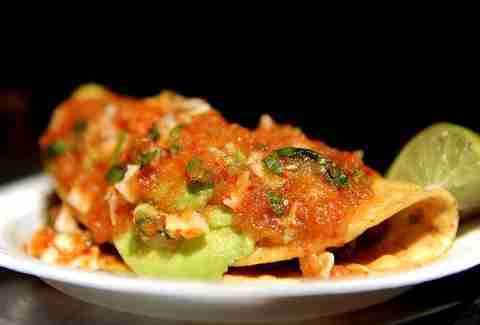 A few years ago, the famous Mexican chefs behind La Casita Mexicana in Bell opened a food court stand in Baldwin Hills dedicated to the fried and rolled tacos known as flautas. Forget everything you know about taquitos: These bad boys are longer than a Wetzel's pretzel stick, and come topped with an array of sauces and salsas. Okay, so they're not exactly tacos, because the tortilla is flat instead of folded, but, um, just fold it yourself? No matter how you consume these things, the oddly-and-deliciously-laden-with-fruit ceviches at this out-of-the-way spot are totally worth the drive. 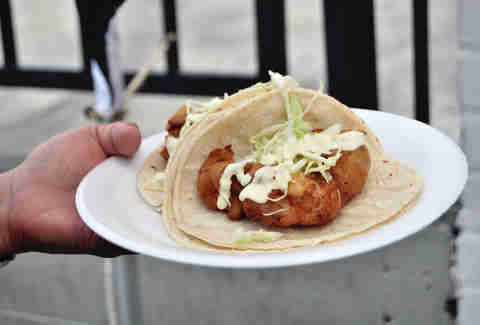 Calling this popular truck's offering a "fried shrimp taco" doesn't quite do it justice. it takes a tortilla, stuffs it with a magical shrimp paste mixture, and drops the whole thing into the deep fryer. The salsa and slices of avocado laid on top cool it down a bit, but make no mistake about it, this taco dorado de camaron is the hotness. What started off as a late-night grill on the streets of Downtown LA is now a brick-and-mortar stand on the outskirts of Chinatown, celebrating its three-year anniversary this week. It's known for carne asada, but the al pastor is pretty bomb too. Four words: pit-roasted lamb barbacoa. Those are the only four words you'll need when you hit this super-popular, three-store chain with locations in Chula Vista and Tijuana. 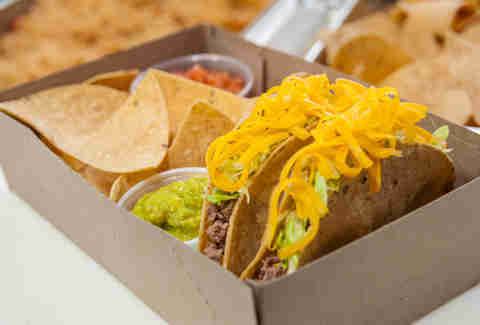 Haters gonna hate on this Culver City institution that specializes in hard shell tacos stuffed with beef and covered in iceberg lettuce, chopped tomato, and florescent yellow cheese. But here's the thing: it's the best hard shell taco stuffed with beef and covered in iceberg lettuce and florescent yellow cheese you've ever had. The only thing better than a Tito's Taco? Nothing. Nothing is better than a Tito's Taco. This teeny-tiny taco shop is worth making the trip (and circling the place before finally deciding to just pay for parking even though it’s more expensive than the taco you’re about to eat) for the perfection of its flour tortillas, which give some extra oomph to burritos and chimichangas. Expect long lines and barely any seating -- and the urge to immediately get back into that line again if you order anything less than the entire menu. When it opened, this taco shop/deli/market/whatever was confusing to the neighborhood, but no more. 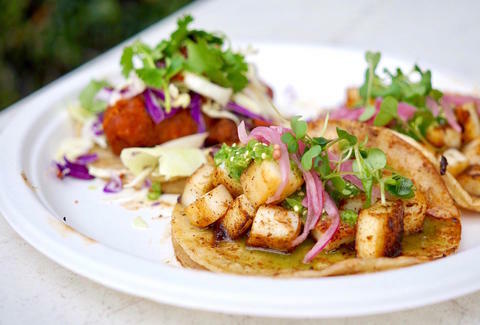 Nowadays, everyone knows the move at this locally beloved, non-traditional taco shop is to get the beer-battered fish taco -- and then also get the sea urchin chile guero, for obvious reasons. This truck's location sounds like a warning uttered by Emilio Estevez in Judgement Night (at the end of a dead-end street in East LA), but the tacos make the risk of hearing a Sonic Youth/Cypress Hill duet worth it, with ultra-killer carnitas the MVP on a menu full of VPs. There's too much competition for the original location of Guisados to be the best taco in Boyle Heights, but in Echo Park, it isn't even close. 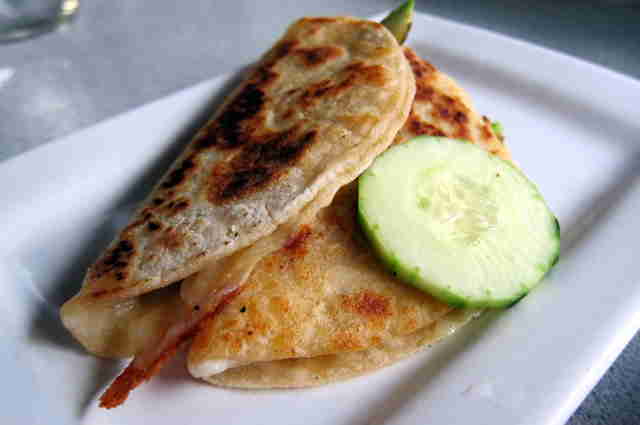 The handmade corn tortillas. The sultry braises. If every taco place on this list had a six-taco, $7 sampler platter, the world would be a better, taco-ier place. It’s fair to say that, before the opening of Salazar, you probably hadn’t been to Frogtown: the artists collective/rapidly gentrifying neighborhood abutting the LA river. If you haven’t been there since Salazar’s opening, though, you’re missing out: Open grill-cooking means this mostly patio restaurant’s al pastor and carne asada numbers taste great, and are even better with one of its fantastic margaritas. The whole grilled fish, the ceviches, and the shrimp dishes at this Sinaloan seafood restaurant are insane, but don't sleep on the smoked marlin tacos. Perfect before a show at the Forum, or after you drop a friend off at LAX (they don't have to know you only offered to do it as an excuse to eat here). Uh, on Tuesday, every taco is $1 (except $2 fish tacos) and beers are $1.25. If you're going anywhere else, you're making a mistake. You should only be eating at Best Fish Taco In Ensenada if this street side tent across from Vons is closed (or there's a comedy night going on there). Dipped in batter and double fried, these Baja-style fish (and shrimp) tacos will have you wondering why you ever bothered with anybody else's. Be sure to wash them down with one of the $1 aguas frescos. There's nothing more exciting than driving by this gas station taco truck late at night and spotting the al pastor spit in action. It’s not always available, but when it is, feel free to go nuts: The meat’s spit-to-tortilla and topped with a small hunk of pineapple, and it’s inexpensive enough to order four. Or eight. Or 12? 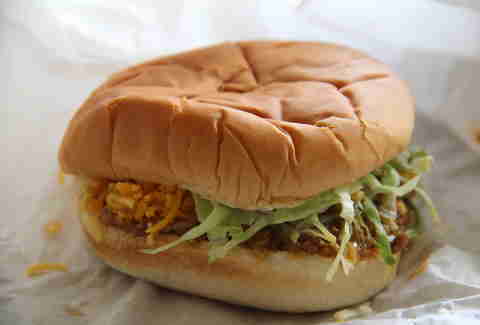 Like Tito's, Henry's may not be the most "authentic" taco in town, but if you're down to taste the nostalgia of childhood (and not the sad porkiness of adulthood) hit up this recently moved joint for hard tacos and the sorta Sloppy Joe-ish taco burger -- just make sure you get extra crack-laden red-sauce. This truck favorite of Jonathan Gold's had a longstanding rivalry with the also-great, on-the-same-block El Taquito Mexicano, and there's really no going wrong at either spot, unless you're team Gold, then there kind is. 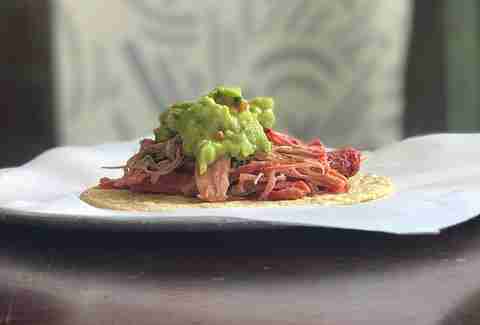 Fans of true carnitas will likely turn their noses up at a Kosher taco joint, but one bite of the beef and duck confit "carnitas" at Mexikosher will change that -- plus, it's all made up by a Top Chef dude. Double win. These fish tacos are no Ricky's, but if you've ever tried driving from Santa Monica to Los Feliz, you won't hold it against them. And your vegetarian friend will love the cauliflower tostadas, please. The opening of Home State a couple years ago was a godsend for anyone who ever moved to LA from Texas and said "why the hell aren't there great breakfast tacos in LA?" Now they can say there are. Oh boy, there are. You may think you know carnitas, but if you've never been to the Carnitas el Momo truck, then you're missing out on the best carnitas in LA. Deep fried in a giant copper cazo, before being hacked into hunks, these carnitas feature all the parts of the pig -- including cartilage and skin -- cooked to a point of tenderness that will convert even the most squeamish of eaters. The only downside? It's only parked here on Saturdays and Sundays. Chef Rocio Camacho might be known for her mole and her restaurant's killer Sunday all-you-can-eat brunch buffet, but -- pro tip -- her sour orange juice and achiote paste marinated cochinita pibil tacos are pretty great, too. This beloved Westside truck stuffs beans into its tacos, giving them weight over the competition. Literally. Zach Brooks is the founder of Midtown Lunch and Food Is The New Rock, and Jeff Miller is the editor of Thrillist LA, and chances are they're eating lunch together right now. Follow Zach at @foodisnewrock and Jeff at @ThrillistLA on Twitter.